On one side, the 6′ 10″ wide x 6′ 3 1/4″ high x 25″ deep display contains a full color 48″ x 96″, 16mm Daktronics electronic message center (EMC) board. 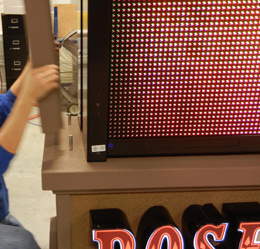 The reverse side sports an illuminated cabinet with a Daktronics gas pricer. The display also features a set of LED channel letters on one side and a variety of Gemini letters on the other. 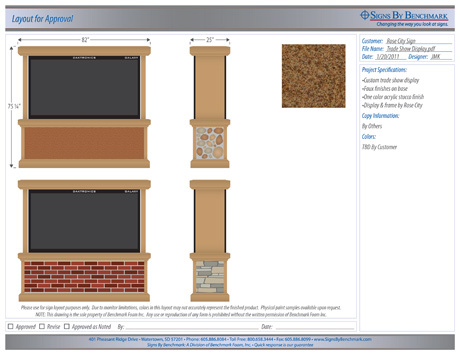 Five faux finishes are incorporated: brick, river rock, stacked stone, granite and stucco. 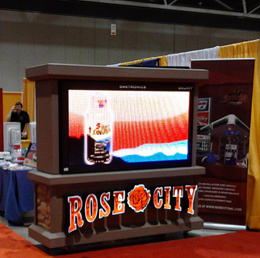 The display will be used to showcase the skillful partnering capabilities of Rose City Canopy & Sign and Signs By Benchmark at the PACE Petroleum and Convenience-Store Exposition of Mid-America. 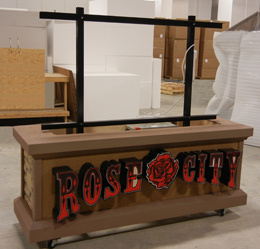 As a wholesale sign manufacturer, constructive partnering with sign companies is what Signs By Benchmark excels at. Building and maintaining mutually beneficial relationships while providing unique signage and architectural accents is always its priority. 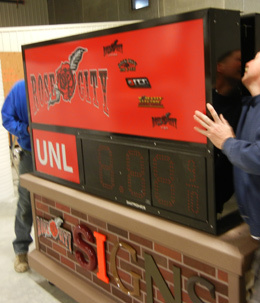 Give the creative team at Signs By Benchmark a call today at 800-658-3444. Discuss your projects with them, then enjoy a positive experience – from conception through product delivery. To view some examples of Signs By Benchmark’s durable, quality signage, browse our website photo galleries.